After our weekend shakedown trip, we spent this week trying to get everything arranged and set up or put away in Freddy. We have quickly discovered we have far too much to fit in this van. At least I have come to that conclusion, but we will continue to pare down and streamline and see how well we can load. We officially started our “Urban Camping” last evening. I had work today and Michelle school, so we tried to be as organised as possible. My biggest concern is where we can safely leave Freddy, especially in an area that Urban Camping seems not to be acceptable. Michelle goes to school in the city we are in while I work some 40 minutes away so the big question is, “Where is Freddy going to be safe”? I find people especially family are not overly receptive to our plan with the exception of a couple of people. We are trying to be totally self-sufficient without including anyone. We had an idea of parking in the parking lot at Michelle’s school, after all, she is allowed to have a vehicle there at least through the day. But what do we do on the days she works? I neglected to say, Michelle does not have a drivers license yet. So on the days she works, she will have to leave school and head to work, leaving Freddy all by himself which could prove problematic. There are days that I do not make it back from work until well after 19:00 (07:00 PM) so that idea is out. The other big issue is that we have a car, so we need to play the good old shell game of hide the car, hide the camper! Interesting is it not? Last night, as we prepared for our first night out and about, I came up with the idea of asking a Manager at a local business if I could park my van in the back of his parking lot during the day, so I can carpool to my job. I know, a small white lie, but it worked! 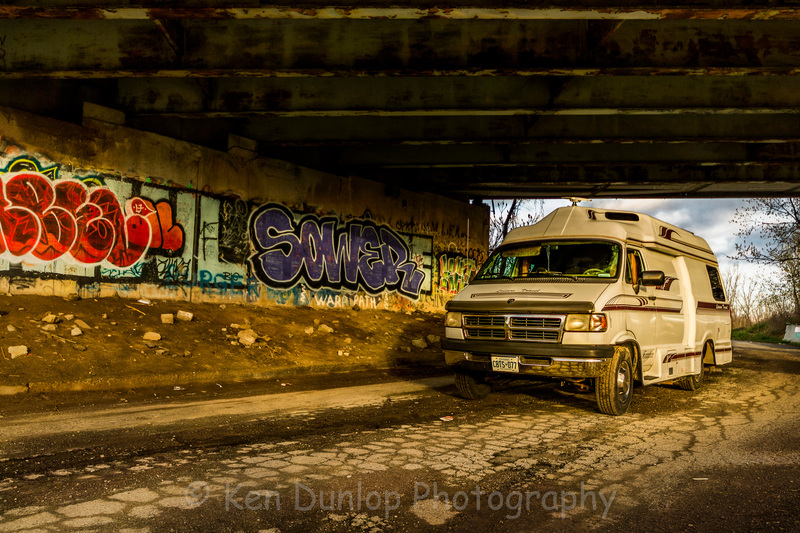 We think the biggest piece of advice we can give is don’t over think your Urban Camping plan. The issue is, you know it what you’re doing, and everyone in your inner circle might know. But, the general public simply sees a van, in a parking space, and not a couple camping, in the parking lot. We kind of cheated last night because we spent the night in the Walmart parking lot, right near a big Class A with a tow vehicle. Rather obvious what we were doing, but let’s get some positive experiences at the beginning. Tonight’s plan will be to head down near one of the beaches on Lake Ontario or Lake Erie. If you have never lived close to the water, there is nothing more beautiful then the sound of water crashing on the beach. We can not wander off too far tonight, Michelle needs to be at work for 10:00 am tomorrow. So once again we will keep it close to her work. I hope to work on some coverings for the windows, as well as some video for the tour video of Freddy we are hoping to get finished. I am thinking of using some of the ideas I have seen on American Renegade’s YouTube channel. We like his idea for window coverings using reflectex, earth magnets and some flat black paint. I would also like to get up early tomorrow and shoot some long exposure images down by the old tallship, there is nothing more beautiful than a sunrise or sunset. If you want to see some excellent images, stop by www.kendunlop.com and see some of his long exposure work.